I tried to enjoy this book. I really truly did, but it was three days and 122 pages in, and I wasn't grasping anything I was reading. It became a chore to read, and I wasn't enjoying it at all. It's not often that I mark a book as DNF (did not finish) - case in point here. 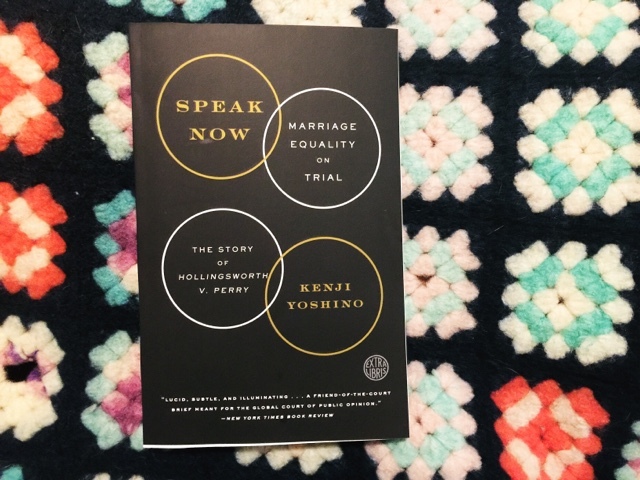 I chose to read this book as my political memoir on my 2016 Reading Challenge, and as a supporter of marriage equality, I truly thought that I would find this book interesting. Not to mention I love a good memoir. Unfortunately, this book turned out to be more of a text book than a memoir. Truly, if I needed to cite a reference for a paper on Proposition 8, this would be a great source. This book even goes as far to have an index and timeline provided in the back of the book. Furthermore, this read just like a textbook. As mentioned before, it felt like a chore to read this book, and I wasn't really grasping what I was reading. I talked in previous posts about how I enjoy a book that is a simple read, something that I don't have to think too hard about, characters that I connect with. This book didn't have any of those things. Plus, it just from 2008 to 2002 to 1996 back to 2002. It was just complex and too confusing. It is definitely not a book that I would read for pleasure, but that I would read for class. I was disappointed because I was looking forward to learning more about Proposition 8. I'm not strongly political. I vote, and have my opinions about certain issues, but politics are not something that I really dabble in, and I think that's something else that made this book so difficult for me. I would like to have read a personable account of the case, with more dialogue. Perhaps this would be a more interesting read for someone who more greatly understands political processes. If you're interested, you can find more information on the book and its author here. Sidenote: Make sure to come back Friday for a book giveaway! Sounds like an interesting read! But thanks for the warning that it's more like a textbook...now I can go in with my eyes open. Yeah. It would be a great read for someone interested in political nonfiction. It just wasn't for me.